Nevada Beach consists of two separate but related parts. 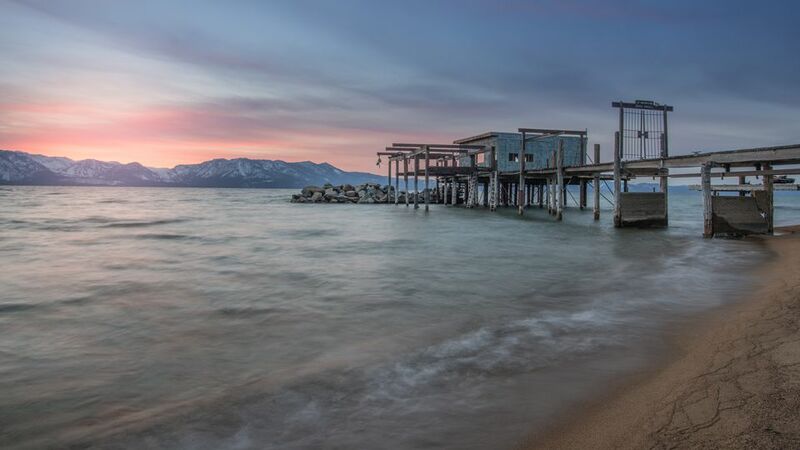 The day use area features one of the longest and widest public beaches on Lake Tahoe. The Nevada Beach campground has 51 sites. Lake Tahoe is visible from most campsites and it is a short walk to the beach. Nevada Beach is an easy drive from the Reno / Sparks area and offers a peaceful retreat in the beautiful Lake Tahoe Basin. Nevada Beach is a U.S. Forest Service campground and beach and part of the Lake Tahoe Basin Management Unit. Facilities at Nevada Beach, both the campground and day use area, are operated under a special use permit by California Land Management, a private concessionaire. The Nevada Beach day-use area features a huge expanse of sand that reaches from shady picnic spots with tables all the way to the shore of Lake Tahoe. There are picnic pavilions, though these are reservable and may not be available on some days. At the shoreline with Lake Tahoe, the water stays shallow for a ways out, making it an ideal play area for families with kids. Even so, proper water play caution is always necessary to ensure a safe and fun day at the beach. It's a good idea to bring beach umbrellas or other types of shade as there is none where water and sand meet. Leave the dogs at home - pets are not allowed in the picnic area or on the beach anywhere in the day use area. The day-use fee is $7 per car. You pay an attendant upon entry or use the self-service system if no attendant is present. There is parking all along the road parallel to the beach, but it can fill up on busy days. Facilities include flush toilets and drinking water. The vehicle length limit is 45'. The Nevada Beach campground is in a grove of tall pine trees and mostly flat. There really aren't any bad spots among the 51 campsites, and you can see Lake Tahoe from most of them. The campground is a quiet oasis in the midst of the hustle and bustle of Stateline / South Lake Tahoe tourist activity. It is a popular family destination, with lots of opportunities for hiking, sunbathing, swimming, boating, fishing, or just plain relaxing. Best of all, this family fun spot is just a short drive from the urban confines of Reno and Sparks. Nevada Beach campground is extremely popular and a stay here requires advance planning. Of the 51 campsites, 47 are reservable and they are usually booked solid through the summer. To check availability and make reservations, go to the Recreation.gov online reservation system. Simply driving in and expecting to find an open campsite is usually an exercise in futility, though on any given day a few spots may be available. If you try it this way, be sure to have a Plan B. The nightly camping fee at Nevada Beach campground is $30 to $36. Since Nevada Beach is a federal facility, holders of senior citizen, disability, and regular annual passes receive a 50% discount on camping fees. Other passes may also apply. Nevada Beach day use area and campground are located on the east shore of Lake Tahoe, about 3 miles north of Stateline, Nevada, and South Lake Tahoe, California. You turn toward Lake Tahoe from Highway 50 at Elks Point Road, the go half a mile to Nevada Beach. There is a traffic signal and a shopping center on the east side of the intersection. From Reno, take I580 / U.S. 395 south to Carson City. Follow the signs to stay on 395 south, then take U.S. 50 toward Lake Tahoe. South of Zephyr Cove and about three miles before reaching Stateline, look for the signs to Nevada Beach and turn right (toward Lake Tahoe) on Elks Point Road. This route is approximately 57 miles. An alternative route is to take the Mt. Rose Highway (Nevada 431) from south Reno to Incline Village. Take Nevada 28 right and follow it along the lakeshore to the intersection with U.S. 50. Go right again and follow the highway to the Elks Point Road intersection as described above. This route is approximately 60 miles and more scenic, though considerably slower due to more time on twisty mountain roads. Nevada Beach is an excellent base camp for many activities and events all around Lake Tahoe. It is only three miles from the casinos, restaurants, and nightlife at Stateline / South Lake Tahoe. Zephyr Cove is nearby, where you can book a scenic lake tour aboard the MS Dixie II paddlewheeler. There are other Lake Tahoe water sports adventures as well. For hiking with a view, check out the Marlette-Hobart backcountry, a part of Lake Tahoe Nevada State Park. During July and August, the Lake Tahoe Shakespeare Festival presents plays and other performances up the road at Sand Harbor, near Incline Village.